According to a Gallup poll, fifty-nine percent of America is worried that they will not have enough money saved to retire. Are you? The dynamics of retirement have drastically changed over the last few decades. With defined pension plans now being a thing of the past, 401(K) plans are now the norm. Are you contributing to your 401(K) plan? Are you contributing enough? Here’s a scary statistic: nearly one third of all workers have less than $1000 saved for their retirement. Those 59% that are worried should be! There are endless reasons why people do not contribute to their 401(K). I get it. I’ve lived it. Things come up and life happens. But eventually you need to sit down and come up with a plan. Start small and learn to adjust your monthly household budget. Once that becomes comfortable, increase your contribution to be slightly higher. Adjust again. And continue the pattern. Life will still happen and you may increase your money coming in. Adjust again. If you don’t do this now, what are you going to do when you can no longer work? It will happen one day. You are not invincible. Sit down and describe what retirement means to you (if your married, get your spouse in on this conversation!). What kind of lifestyle do you want? Do you plan on traveling, relaxing on the beach, golfing every day? Do you want to live in a nice sized house or do you plan on downsizing? Figure out your number. How much money do you need to have saved to retire? You cannot figure out how to get somewhere if you don’t know where you’re going. Come up with a plan! How are you going to save? A good idea is to meet with a financial advisor. Learn about stocks, bonds and other ways to save to maximize your retirement portfolio. 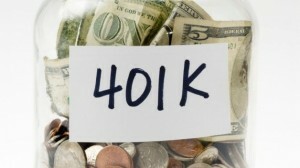 If you’re not already contributing to your 401(K) I encourage you to consider it. If you are a Jenco employee and are interested in learning more about the 401(K) retirement plan, please join us on Thursday, July 17th at 4:30 pm. Representatives from John Hancock and Pittman & Murdough Financial Advisors will be presenting information about the 401(K) retirement plan and future investments. Send me an email to RSVP.